Atari's Greatest Hits provides gamers of a certain age with a blast from the past. It also illustrates the practical limits of nostalgia. The iOS game, which runs in optimized form on the iPhone, iPod touch, and iPad, features near perfect recreations of the Atari console and arcade games you probably wasted too much time and too many quarters on in the early 1980s. Atari's Greatest Hits is a free download, but it initially comes with just one offering—that table tennis game of the future from yesteryear known as Pong. (If Atari really wanted to recreate the old-timey gaming experience, shouldn't the complimentary title be Combat, just as it was in olden days?) You can quickly build up your library of Atari games through the miracle of in-app purchases, though—four-game packs are available for just $1, or you can buy the whole lot for $15. All told, Atari's Greatest Hits gives you access to up to 18 Atari arcade games and 92 virtual cartridges from the venerable Atari 2600 gaming console. The appeal of Atari's Greatest Hits should be immediately apparent to the now-grown children of the '70s and '80s. All those games you enjoyed as a kid—or more to the point, all those games your parents were too cruel to buy for you—are right there for you to own on your iPad or iPhone. And there's nothing you can do about it now, Dad! I'll spend my allowance however I like! Then you download some of the games available through Atari's Greatest Hits. And you discover that maybe your old man had a point. Blast from the Past: If the graphics from this recreation of the Atari 2600 version of Centipede don’t impress you, then surely the oversized control panel will. It's not that Atari's Greatest Hits doesn't do a fine job loving recreating games like Yars' Revenge or Haunted House. Every detail—the graphics, the sound, even the dog-eared manual with instructions for hooking up your Atari 2600 system—has been lovingly recreated. The games play exactly like they did back when you were listening to the likes of Olivia Newton-John and John Cougar on the radio. And that's sort of the problem—graphics that didn't look too impressive on your old CRT television come across as downright archaic on the gorgeous display of an iPhone 4 or iPad. There's also the not insignificant matter of gameplay. The only nod to modernity in Atari's Greatest Hits is the ability to add multiple players via Bluetooth. 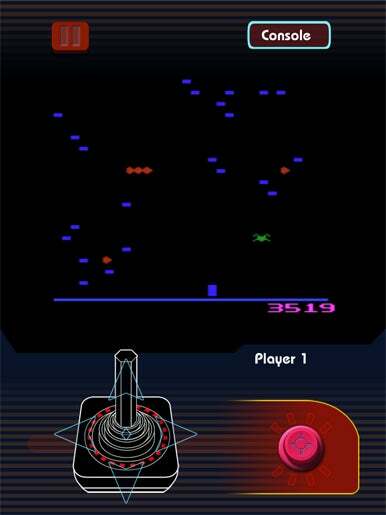 Otherwise, the developer attempts to recreate the Atari 2600's single-button joystick on a touch interface with a joystick-shaped d-pad on the left side of the screen and a button on the right. (You can also summon up the toggle-based controls of the console itself to switch between game modes and the like.) It's not exactly a smooth merging of styles. For one thing, the controls take up a third of the screen, which seems a particularly wasteful use of the iPad's real estate; for another, that joystick is not so easy to operate. The arcade-style games fare a little better—they're primarily button-driven, after all. But even controls like the trackball in Centipede don't feel as seamlessly implemented as they ought to be. 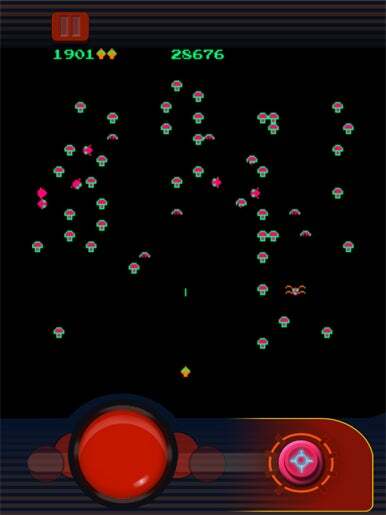 Arcade Fire: Atari’s Greatest Hits does a better job translating arcade games to the iOS interface. I can appreciate the developer's commitment to historical fidelity, but it seems like steps could have been taken to improve the gameplay. On that included version of Pong, for instance, there's no border outlining the playing surface, making it very hard to anticipate where the monochromatic ball is going to ricochet. There are also some disappointing interface decisions—you scroll through games either via a Cover Flow-style carousel or with an A-to-Z listing of titles. Neither approach makes it easy to see what games you've already purchased. I imagine that gamers who grew up with an Atari 2600 will enjoy a few warm memories from Atari's Greatest Hits before the limitations of the iOS implementation force them to abandon the past forever. For modern-day gamers, selling them on the merits of Atari's Greatest Hits will be like showing them cave paintings and arguing that they're every bit as fun to watch as television. Atari's Greatest Hits is good for a stroll down memory lane—it just happens to be a very short walk.